These premium blocks are not simply printed, they’re precision carved. A high quality classic toy that will be enjoyed by your family for generations. 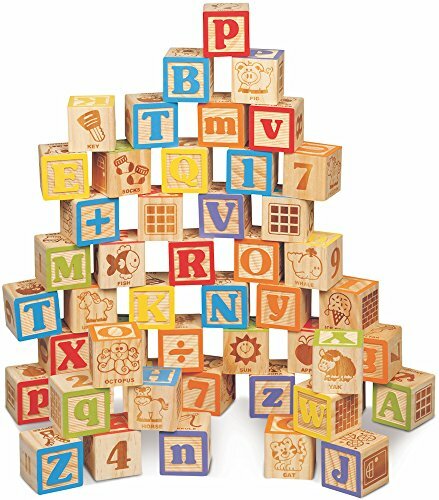 Help your child with their ABC learning, counting, and simple math with this deluxe set of 40 engraved wood building blocks for toddlers. Extra-large 1.8 inch (45 mm) baby blocks are easier to stack, read and recognize pictures! 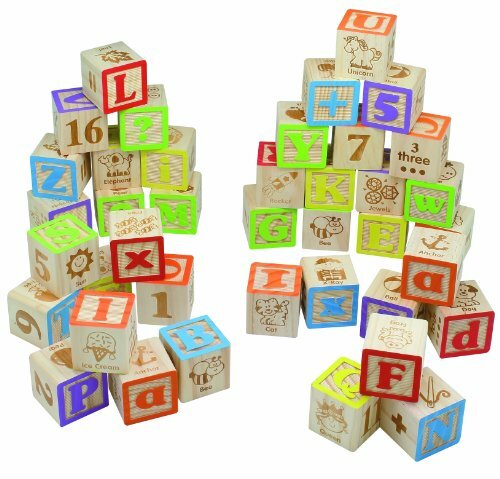 Compare to other brands’ 1.2 inch (30 mm) block alphabet letters--our wood cubes are 3 TIMES BIGGER than the competition. We use 3 times more wood in our blocks! You get a full set of 26 alphabet letters. Plus 6 lettered blocks with duplicates of the most common ABC letters. Plus 8 more blocks with numbers and math to encourage counting, and simple math like addition and subtraction. Designed by educators for kids learning ABC’s, each baby block includes sight words and matching images to help your child begin to associate words to images. Gender-neutral wood and colors make this a good educational toy for girls and boys. Eco-friendly and sustainably harvested. Includes a mesh storage bag to keep wood block set neat and in one place so you don’t lose any blocks. An alphabet learning toy for preschoolers, toddlers and babies age 18 months & up.